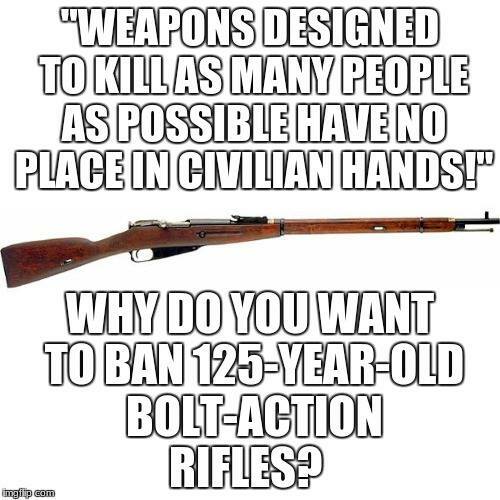 Ask the average “gun control” extremist what their desires are, and they will assure you – ad nauseam – that your “hunting” rifles are safe, and all they want to get rid of are those dangerous “weapons of mass destruction” known as “assault weapons”. 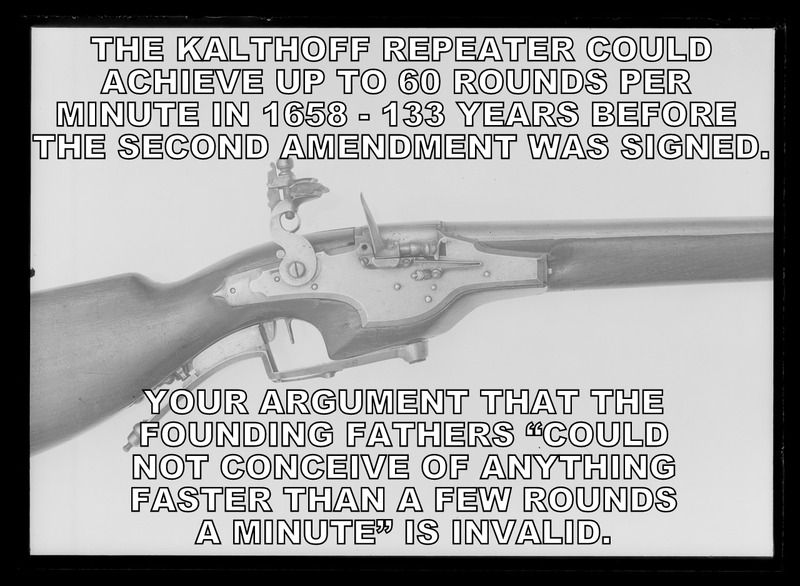 While I think I have done an adequate job demonstrating how the very notion of an “assault weapon ban” is, itself, a meaningless, futile falsehood designed exclusively to attack any firearm the “gun control” organizations happen to not like that day, I have not yet addressed the above “argument”. Not terribly shocking, they are lying – your hunting rifles are emphatically not safe from “gun control” extremists. Take a good look at that rifle. It is undoubtedly scary to people who do not know better – it has an adjustable stock, a pistol grip, an extended magazine, a barrel shroud, a threaded barrel, and – perhaps worst of all – it is painted black. It has none of the objectionable ergonomic features, and, best of all, it is attired in a perfectly acceptable, fuddish color scheme. They are the same rifle. The Ruger Precision Rimfire rifle and the Ruger American Rimfire rifle are both bolt-action, removable-magazine-fed rifles chambered in .22 Long Rifle. In fact, both use the same magazines; you could literally drop the magazine out of the Evil Black Rifle, insert it into the traditional wooden rifle, and keep on shooting with the latter. Likewise, they use the same bolts, and the stainless steel action and barrel will drop in that black stock with just the turn of a few screws. Oh, and the real kicker? The wood-stocked rifle has four more inches of barrel, yielding up to 60 additional feet per second of velocity for the bullet, meaning the “classic-looking” firearm is strictly more powerful. 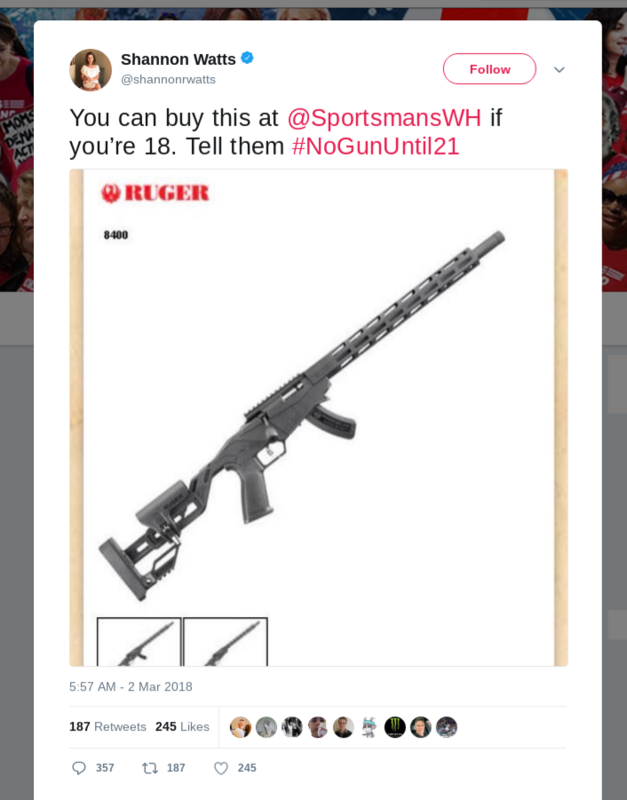 So, allow us to recap: the head of a national “gun control” organization wants to obstruct legal adults from buying firearms that employ 194-year-old technology, which, in turn, has been at the heart of most hunting rifles since the turn of the last century. Even worse, these rifles are chambered in one of the most – if not the most – common hunting caliber for about as long. Tell me again how our “hunting rifles” are safe. 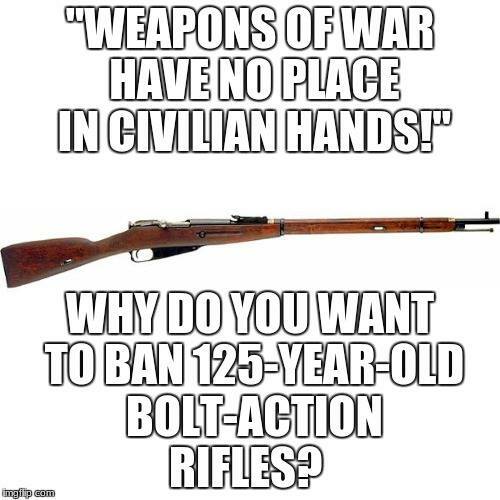 One final nail in the coffin of “assault weapon” bans is that there is no single, universal definition of “assault weapons”, so what is it, exactly, that statists want to prohibit? Wait, no actual definition of “assault weapon”? What do you mean? “Y” of course indicates that the law at the top of the column has a restriction on the feature to the left in the row, and “N” means there is no such restriction in that law. “I” indicates that multiple laws have similar restrictions, but they are inconsistent on the details. For example. the California “assault weapon” ban prohibits semi-automatic firearms with fixed magazines and capacities greater than 10 rounds, while New Jersey sets that bar at 15. Likewise, the lists of specific makes/models are so wildly different – and frequently target firearms no longer even produced – that it would take a whole separate table to adequately compare them. Finally, Hawaii can be largely disregarded for anything except pistols – their laws are largely silent on rifles and shotguns. So let us look at rifles. All relevant states seem to agree that semiautomatic rifles with detachable magazines as well as folding or telescoping stocks, flash suppressors, and grenade launchers are evil, though they cannot agree on whether only one of those final three items is enough for the whole rifle to be evil, or if two are required. If you examine the table, you will see that there are another nine features for rifles that may or may not be evil, but the states simply cannot seem to agree on the finer points. Even more amusingly, grenade launchers are already heavily regulated by the National Firearms Act, and both they and their ammunition are impressively difficult and painfully expensive to procure. Additionally, Connecticut goes to the point of classifying rifles capable of “fully-automatic” or “burst” fire as “assault weapons”, despite those already being massively regulated and functionally banned by the combination of the National Firearms Act and the Hughes Amendment to the Firearm Owners Protection Act. “Double Secret Probation” was supposed to be a joke, not reality. Moving on to pistols, Maryland is largely silent on them, aside from providing a list of makes/models that constitute “assault pistols” and then only permitting firearms on the “handgun roster” to be sold in the state, so we will disregard them for this section. The remainder of the states seem to agree that semiautomatic pistols with detachable magazines as well as a magazine that inserts into the firearm somewhere other than the pistol grip, threaded barrels, and barrel shrouds are all evil, but, again, the “one feature” / “two feature” tests are inconsistent among the laws. Seven other features are mentioned by various laws, including some positively bone-headed ones like pistols with folding or telescoping stocks, or pistols with thumbhole stocks. I hate to break it to the fine legislators of the great state of New York, but there is no such thing as a “pistol” with a folding or telescoping stock – federally, a firearm with a pistol-length barrel and a shoulderable stock is a short-barreled rifle, and, again, is subject to the National Firearms Act. It’s always comforting when legislators have no idea what they’re regulating. Finally, when it comes to shotguns, the only thing the relevant laws can agree is evil is a semi-automatic shotgun with a folding or telescoping stock, or any shotgun with a revolving cylinder. The laws cannot seem to agree on any of the other four possible restrictions, including detachable magazines, oddly enough; those are a consistent point of contention for rifles and pistols, but apparently are less of a problem for shotguns. Of course, handguns with revolving cylinders are perfectly acceptable in any of the jurisdictions that are or were limited by “assault weapon” bans, but revolving cylinders are apparently evil for shotguns. Consistency has never been a strong point for “gun control” legislation, or supporters. So what do “gun control” supporters mean when they say they want to ban “assault weapons”? No one knows, not even them. But that’s why the concept is so powerful – it can be redefined and re-engineered to demonize any firearm that the very few funders of the “gun control” movement care to target. One wonders if those being blindly lead around by those few 1%ers realize how little they, or their supported politicians, know about the very things they are trying to restrict. I am not a lawyer, I did not play one on television, and I did not stay at a Holiday Inn Express last night. It is entirely possible that I misread the miles of legalese I just waded through over the past few days, and either missed a pertinent detail, or misread one. 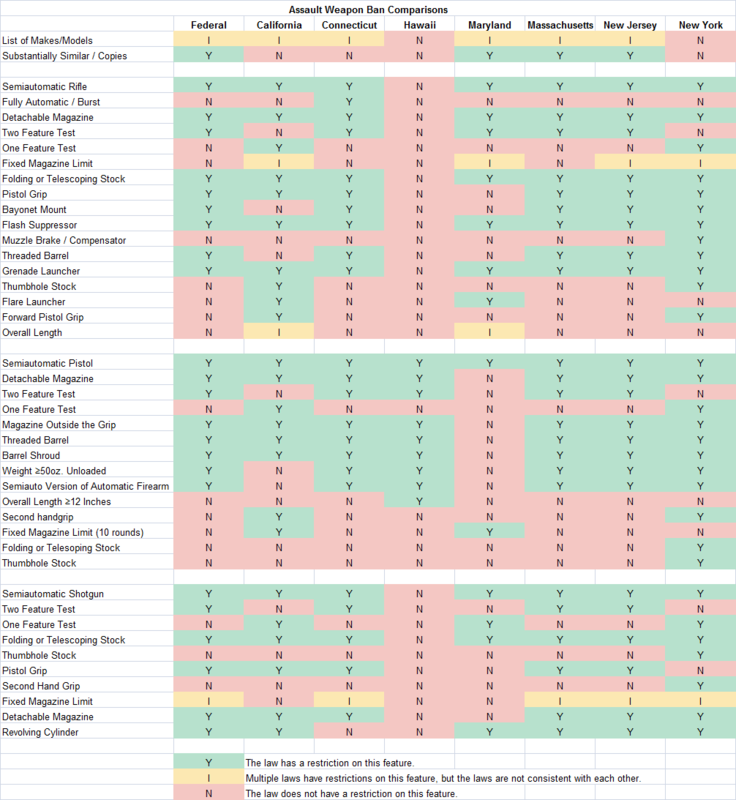 If you find or notice any errors in the above table and associated post, please feel free to let me know, and I’ll update it accordingly.